PANASONIC TOUGHBOOK CF19 MK3@ 1.20GHZ. 2GB RAM 160GB HDD TOUCHSCREEN RUGGED TABLET LAPTOP WINDOWS 7 32 bit. STYLUS PENS ARE NOT INCLUDED. This is an ex corporate Laptop which has been checked by our highly trained staff. Type: Notebook/LaptopBrand: PanasonicProcessor: Intel Core i5 2nd Gen.
Panasonic Toughbook CF-19. Our Panasonic Toughbooks are shockproof, water resistant and can be used in any weather conditions. So you can have peace of mind knowing your Toughbook will withstand anything you can throw at it. Panasonic Toughbook CF19 MK3. STYLUS PENS ARE NOT INCLUDED. This is an ex corporate Laptop which has been checked by our highly trained staff. 500 GB Hard Drive. Free Support. Programs Installed. Toughbook H1 Health. 74-key on-screen keyboard with dedicated Windows key. Alcohol wipe-resistant surface. Battery Life. TPM security chip v.1.2. Integrated Fingerprint reader. RFID reader (ISO 15693 Compliant). Tablet/Laptop CF19 MK3. Panasonic Toughbook Rugged Touchscreen. 1.20GHZ 2GB RAM 500GB HDD. HARD DRIVE WE HAVE GOOD VARIETY OF PRODUCTS FOR SALE. WE WILL MAKE EVERY EFFORT TO SOLVE ANY ISSUE OR PROBLEM IF YOU FACE. PANASONIC TOUGHBOOK. IT HAS A WINDOWS 7 OS INSTALLED BUT IT REALLY NEEDS RESETTING AND DRIVERS INSTALLED. 16GB SSD HARD DRIVE. 5.6" TOUCHSCREEN. ENGINEERS' XENTRY TAB. 2GB 250GB WIN7. WE HAVE GOOD VARIETY OF PRODUCTS FOR SALE. WE WILL MAKE EVERY EFFORT TO SOLVE ANY ISSUE OR PROBLEM IF YOU FACE. THIS IS A USED MACHINE. IT IS FULLY TESTED AND IS IN PERFECT WORKING ORDER. The industry’s most rugged handheld tablet PC. With superior ergonomics, a 10.4" sunlight-viewable screen and sealed all-weather design, the H1 Field lets you work virtually anywhere. Panasonic ToughBook CF-H1 - 10.4in - atom CPU - 2GB RAM - 64GB SSD - Windows 7 Pro Loaded Boxed and Complete with AC & Lead (Certified Refurbished). PANASONIC TOUGHBOOK CF D1 @ 1.10GHZ. 2GB RAM 250GB HDD TOUCHSCREEN. RUGGED TABLET LAPTOP WINDOWS 7. 3 Months Warranty for software issues. Programs Installed. 1366 x 768. WE HAVE GOOD VARIETY OF PRODUCTS FOR SALE. WE WILL MAKE EVERY EFFORT TO SOLVE ANY ISSUE OR PROBLEM IF YOU FACE. THIS IS A USED MACHINE. IT IS FULLY TESTED AND IS IN PERFECT WORKING ORDER. KINDLY SEE THE PICTURES FOR ILLUSTRATION PURPOSES. 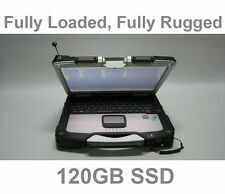 PANASONIC TOUGHBOOK CF-19 MK3 RUGGED LAPTOP. Model: Toughbook Cf-19 (MK3). Model No: CF-19 (MK3). Hard Drive 500GB (if you need SSD, just ask and I will be happy to quote). There's a 500Gigabyte hard disk drive fitted. PANASONIC TOUGHBOOK CF D1 @ 1.10GHZ 4. GB RAM 250GB HDD TOUCHSCREEN. RUGGED TABLET LAPTOP WINDOWS 7. 3 Months Warranty for software issues. Programs Installed. Accessories & Functions 1366 x 768. PANASONIC TOUGHBOOK CF-D1 MK1 RUGGED LAPTOP. Model: Toughbook CF-D1 (MK1). Hard Drive 250GB ( upgrade to 256GB SSD £70, 512GB SSD £120, 1TB SSD £180 ). It has all the usual ports andinfrared. UPGRADED TO 4GB SO WINDOWS RUN FASTER. Panasonic Toughbook CF-H2. With bump case. 500gb HDD W7 pro 3650 hrs. 500GB HDD Hard drive. 8 gig of ram, windows 7 pro 64 bit. 500 GB HDD. Windows 7 pro 64 bit. This is a great machine. Interfaces External Display: None (available via optional cradle). Serial (RS232C): None (available via optional cradle). LAN: None (available via optional cradle). USB 2.0: None (available via optional cradle). Only 2890 hours use, This may increase by a couple of hours after final checks. 500GB HDD. Has a few scrapes on the HDD cover and lid. 8 gig of ram, windows 7 pro 64 bit. Windows 7 pro 64 bit. This is a nice clean machine. Panasonic ToughBook CF-19 MK4. Storage (HDD): 500GB., 1000% Happy With Item. We can only apologize for this, and hope this does not cause you any problems. BER (Beyond Economical Repair). Okay Condition – Large Dents, Cracked Casing etc. Pansonic Toughbook CF-31 Model: CF-31UEUAXDE PC. Hard Disk Drive: 500GB. OS: Window 7 Pro 64-Bit. VLC Player- Good For Watching Movies. Optical Disk Drive: DVD Mult-Reader. Adobe Reader- Good For Viewing, Printing, Signing, and Annotating PDFs. Type: Notebook/LaptopBrand: PanasonicProcessor: Intel Core i5 3rd Gen. Powerful, rugged and wireless. With drop-shock protection and a MIL-STD-810G certification, it’s the undisputed leader in the fully-rugged category. TOUGHBOOK CF-31. Panasonic Toughbook CF-31. (MK4 version). Panasonic Toughbook CF-19. Hard Drive : 160GB SATA. Screen Size : 12.1" touchscreen. CD Drive : None. AC Adapter : Included. Battery : Minimum 1 hour standby. Collection station availableBrand: PanasonicProcessor: Intel Core i5 1st Gen.